SCARY HORROR STUFF: "The Walking Dead" Phenomenon: Zombie SOAP OPERA or ZOMBIE Drama? "The Walking Dead" Phenomenon: Zombie SOAP OPERA or ZOMBIE Drama? Don't lynch me.... Or string me up on a tree and shoot the living sh*t out of me. But I sadly have not seen even one episode of "The Walking Dead" since it first started walking into TV screens everywhere around seven years ago. That's not for lack of interest or even trying; I just simply haven't had the time or energy! But without a doubt, the phenom that is THE WALKING DEAD has swept the nation as far as zombie media goes, and you know zombies are the thing these days, given the sweeping sensation of film and television (28 Weeks Later, Z Nation, iZombie, Fear the Walking Dead, World War Z, yadda yadda....). Yet, What Makes THE WALKING DEAD Such a Hit? Again, don't lynch me. Because I, for one, can't even claim to review anything about the show except to know the fact that the central point of the series is its characters and not the linear plot chased by revenants galore. You know the drill: zombies chase humans, many humans die, chances are one human survives. End of story. It seems, though, THE WALKING DEAD, goes far above and beyond that. It is a story about survival. At its core. And I believe that's quite the draw. Most of the time a zombie story centers around the actual plot, a goal -- to survive against all odds. THE WALKING DEAD, however, is about survival not just from a zombie holocaust, but survival as a human race together, facing a new beginning unlike anything we've seen. It is, at its heart, a true dystopia. It just so happens that this dystopia is literally littered with flesh-eating zombies. Oh, joy. Obviously the characters resonate deeply, especially when you see Negan with his familiar bat, and there's more to this than just a chase away from the zombies. The undead are not the only antagonists. Is That Too Much of a Soap Opera, Though? We love the characters, obviously. But where's the driving point to what happens with the zombies here? Will there be an end? Are they looking for a cure? Will there be an all-out war? When it comes to zombies, there always seems to have to be an end point to all of this. Kill all zombies. Or be killed. However, THE WALKING DEAD doesn't seem to walk that fine line. It dances around it in wide circles and makes for great TV in the sense that this is a show about human relationships. Now whether you like that or not, that's another story. 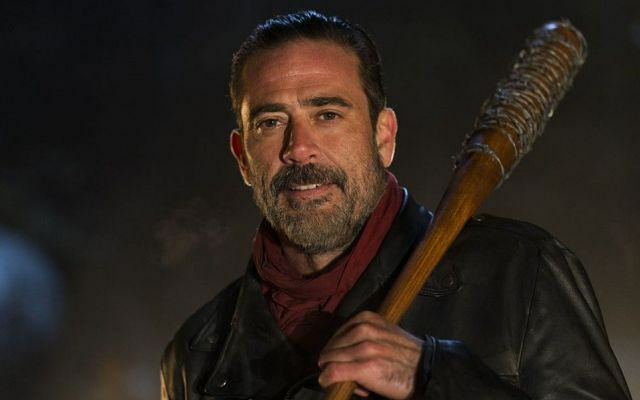 Plenty people seem to, although many were aghast at the most recent season opener regarding Negan and his apparent bat-swinging tendencies. What say you all? THE WALKING DEAD still the infamous hit it is? Or just another "Lost"-type soap opera running out of steam where the humans seem to look at those walkers not with trepidation, but with sheer discomfort and frustration? I mean, come on.... The zombies are what we watch for! Right?